Guest Post By Lucy The Rat – Hey, Look! A Writer Fellow! Because my person is getting assaulted by whimsy at Disney World, I was asked to take over his blog this week. It’s great to be here! So! I understand that many of you are Crazy Cat People. My person and I are not fans of cats. Did you not know that? And it’s worse than you think. Last year, my person even installed a gun turret on the roof of his KIA Spectra. Whenever he is unable to sleep; or gets writer’s block; or has that strange, faraway look in his eye, he’ll hop in the car and cruise around the neighborhood searching for feral cats to spray with bullets. Even I find this behavior disturbing. But I have said too much. Let’s just sat that my person has a touch of the cray-cray and leave it at that. Anyhoo… The day after my person left for Disney, I decided to visit the local gals who live under the Burger King dumpster. The sewer rats agreed, and a good time was had by all. On a related note, I have a rat cage full Pall Malls that need to move ASAP. I know Pall Malls are pretty much only smoked by gas station attendants, but if you’re willing to switch brands and/or become a gas station attendant, I’ll make it worth your while. $1.50 a pack. That is not a typo, Cat People. To get a great deal like that anywhere else you would need a Hot Tub Time Machine. So gimmie a call. Or if you don’t smoke, no prob. I’ll use my time here to chat with you about anything at all. Fire away, peeps! Previous postI’m Going to Disneyworld! I’m such a bargain hunter, that I’m actually considering your offer. Sadly, I’m not allowed to smoke in my house or car, and none of my friends will allow it either. Any suggestions?? I understand. It is difficult to find a smoking section these days. Have you considered under the Burger King dumpster? My rat pals wouldn’t mind at all. You can probably sell those Pall Malls to prisoners and make a fortune. Just saying. 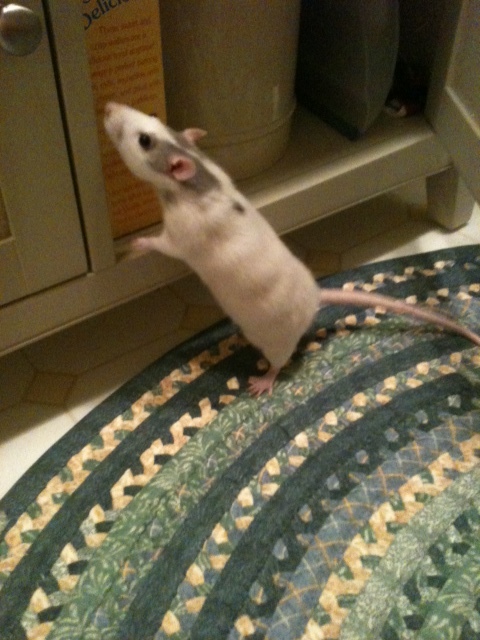 Also, I may be a Crazy Cat Person, but I consider myself a friend to rodents as well. Oh, your reputation precedes you, Madame! Your brave squirrel rescue attempt makes you A-OK in my book! And that prisoner idea of yours? Genius. Just don’t sell to scientists, Lucy. Lab rats have a tough enough time without secondhand smoke giving them additional problems! Ooh, I hate those scientists! Hate ’em! Hmm… Maybe I’ll take the ol’ KIA Spectra out for a spin. There’s gotta be a lab around here somewhere. Are you sure Lucy’s a girl? If she is, she’s definitely my kind of girl. Badass rats…always trying to make a buck. I’m sure I could take you. I say free smokes for all!! Step aside, Commie. You’re blocking the paying customers. OK, Lucy, step aside! I hear through the grape-vine that your person is back! Is it true??? You heard right. Did you also hear that he’s lazy? I’m in charge until Saturday. So! Need some smokes? They’re goin’ fast! I’m using $10 bills for rat bedding, baybee! I suggest you go cold turkey and use those $10 bills to buy yourself a running wheel and get in shape for the rat triathlon. Dang it. I ruined the illusion by flaking out and posting as myself. Unless…Lucy hijacked my account. Yes! Let’s say that happened. Lucy found my passwords and hijacked my account! So that’s how she got all that cash! I caught her sleeping on a wad of twenties! It sound’s like your pirate rat would’ve gotten along just fine with a gerbil I had when I was a kid. The little guy couldn’t stay away from my Star Wars stuff. His favorite thing in the world was to knock over all the figures and then stow away in my Millennium Falcon. Rats’ lives are just too short, aren’t they? Lucy had a roommate (named Ethel, of course) who died of cancer late last year. Lucy looked like she might suffer the same fate, but after her operation, she is now fit as a fiddle. Pinky the Cat here. What?! Your person shoots at cats for fun?! You have no idea how distressing this is to the superhero cats who protect the world from ra… so where’s that dumpster?